During this year’s Georgia General Assembly session, state legislators passed a little-known bill approving yet another 1% sales tax. The new law, HB 277 – Transportation Investment Act of 2010, divides Georgia into twelve zones (based on existing State Transportation Board districts), which will each have control over their own state-funded road projects. The bill also allows residents of those zones to vote for an additional sales tax, the Special District Transportation Sales and Use Tax – which we’ve dubbed SPIDITSLUT because it’s easier to type and sounds dirty. If approved by voters, SPIDITSLUT would be in place for ten years but only apply to businesses within zones whose voters approve it, with generated revenue going back to road maintenance budgets for the cities and counties located within each zone. This sounds good in theory, but there are several issues with the bill that we have concerns about, the first being a new layer of bureaucracy being added to the existing pile of overlapping state agencies that directly oversee road work. We already have the Senate Transportation Committee, 12-member State Transportation Board, Georgia Regional Transportation Authority (which oversees metro Atlanta projects), the GDOT Commissioner, Governor’s Development Council, and GDOT Division of Planning. With that many layers of state bureaucracy, plus oversight from state and federal agencies like the federal DOT, EPA, NHTSA, and Georgia EPD, it’s little wonder most of Georgia’s state-funded road construction projects take a quarter-century of planning and debating before the first speck of dirt gets moved. But that will worsen when this new plan adds in a centralized “Georgia Coordinating Committee for Rural and Human Services Transportation,” a “State Advisory Subcommittee for Rural and Human Services Transportation,” and those 12 regional “roundtable” committees made up of local leaders and people appointed by the governor. Per the bill, each county will send one commissioner and one mayor to serve on the roundtable, which means for Walker County we’ll end up with Bebe Heiskell and either Neal Florence or Chickamauga’s Ray Crowder representing our interests to the state. In their current elected jobs all three have shown a complete lack of competence in regards to road project priorities, and no doubt that incompetence will continue as they serve on our roundtable. But decisions won’t actually be made by the roundtable anyway; real planning will be done by an executive committee made of three local legislators (Jeff Mullis and two others from the state house) and five chosen from the roundtable. Those five will likely represent the highest populated counties or cities in each zone, and in our region that means leaders from Dalton, Ringgold, and Dahlonega will be dictating where the local share of SPIDITSLUT money gets spent. Walker County will be in the same under-represented boat it’s already in, but with higher taxes, less road money available, and additional levels of government red tape keeping much-needed road projects from being done. Having so many out-of-district leaders to rub shoulders with might help Jeff Mullis’ chances at winning a US House seat once he creates a new House District for himself in January. Those same Dalton, Ringgold, Chatsworth, and Calhoun people he serves with on the roundtable executive committee will be called to endorse him for that new district’s first elections in July and November 2012. But a taxpayer revolt against the new plan (along with unexpected negative reactions from some local leaders [see below]) might actually make that goal more difficult for Senator Mullis to reach. An even bigger problem is the addition of yet another 1% sales tax on top of the state’s existing 4% tax, two 1% sales taxes for local schools, and Walker County’s misspent 1% SPLOST tax. That’s a total of 7% now on everything except some groceries (which are only subject to the 3 county taxes), rising to 8% if SPIDITSLUT is approved by voters in 2012. That’s eight extra pennies added to every dollar spent. By comparison, northern neighbor Tennessee has a state-wide 7% sales tax, accompanied by local taxes ranging from 1.5% to 2.75%. In Hamilton County TN, the combined state and local sales tax is 9.5%. That’s higher than what we’ll eventually see in Walker County under the SPIDITSLUT, but only by 1.5% – and unlike Georgia, Tennessee residents aren’t subjected to personal income taxes. 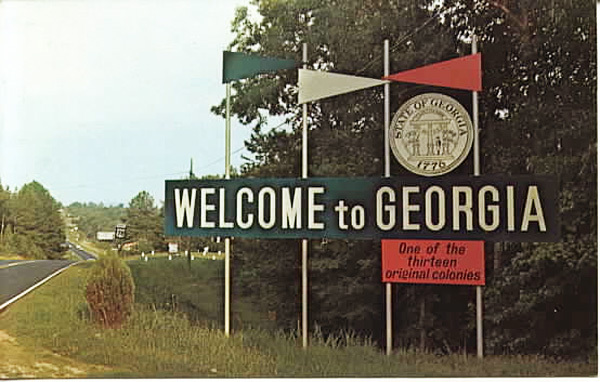 Georgia residents and guests also pay the state’s gas tax at the rate of 12.4 cents per gallon. All revenues from the state gas tax are supposed to go directly to GDOT for state and local road projects, and in most years that’s been enough to cover most of the state transportation budget. However, according to our very own State Senator Jeff Mullis, chair of the Senate Transportation Committee, the fuel tax alone isn’t enough anymore because higher gas prices have encouraged people to drive less and be more fuel efficient. According to him, that results in fewer gallons of gas being sold and fewer gallons being subjected to the state’s 12.5 cent tax. Obviously Senator Mullis doesn’t spend a lot of time driving around Walker County or waiting to fuel his vehicle at the Kangaroo. If so he would notice, as we have, most people haven’t cut back their driving (unless they no longer have a job to drive to), and many county residents are still operating the same inefficient vehicles they were driving five or more years ago because they can’t afford to buy anything else. Senator Mullis didn’t point out that one of Georgia’s revenue problems in regards to roads are millions of dollars the state spends each year paying off GDOT loans. Those loans, adding up to some $300 million in the last few years alone, went to pay for pet projects (primarily new construction) Governor Perdue deemed necessary for the state’s future. Those projects, nearly all in the Atlanta area, were approved by the Senate Transportation Committee, which Mullis chairs, and the legislature as a whole. Money going to pay down those Atlanta traffic congestion reduction loans, along with general fund money wasted on things like a planned renovation of the Georgia Dome, cash bonuses for retiring employees with vacation days, parts of Georgia Public Broadcasting, and (some would argue) the salaries paid to state legislators, would more than pay for state-wide road maintenance if it wasn’t being wasted. But cutting out that kind of waste requires representatives and senators willing to make hard decisions, choosing to sacrifice their own pet projects and paychecks instead of demanding more money from the people. Why are roads made a last priority in the budget, taken care of after so much unneeded junk and waste? Because important budget items can be pushed to the edge and still find voter support. Citizens of Georgia wouldn’t vote in favor of a tax to cover state senator paychecks, Georgia Dome renovations, Atlanta airport expansion, MAGLEV train studies, or new misspelled signs for highways renamed after Civil War soldiers – but when those items are paid for with general fund monies, taxpayers willingly approve new taxes for core government responsibilities like roads, schools, and public safety. Often those new taxes don’t work out as advertised. Locally in 2008 we were sold on the Walker County SPLOST sales tax with promises of road projects, bridges, rural water service and other vital infrastructure – but now that we’re stuck paying the tax it’s mostly been used for silliness like the Villanow Community Center, unneeded new softball fields in LaFayette, a library expansion, property purchases in Kensington, and tacky Christmas lights – while the county’s roads and bridges continue to collapse. SPIDITSLUT tax revenues might well go the same way, being wasted on pet projects and pork instead of local roads – someday requiring us to vote in yet another tax to cover the costs of road maintenance. So on it goes. Three, four, five, or more individual 1% sales taxes stacking up on each other in an increasingly worsening economy. Core tax revenues are frittered away on nothing productive and we gladly accept new taxes to pay for things that once served as the central purpose of state and local government, even though we should be rejecting new taxes while demanding accountability for all the other taxes we’re already stuck with. We at the Underground will undoubtedly be classified the same way, anti-roads and anti-progress, because of this article in opposition to the SPIDITSLUT tax. But little could be further from the truth. 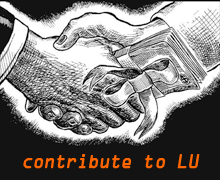 Reading through LU archives from the last year, there are at least five articles bemoaning the sorry condition of local roads, and all call for state, county, and city leaders to use tax revenue (including SPLOST funds) to repair infrastructure before wasting it on special projects and hobbies. We aren’t anti-road, we’re anti-waste and anti-tax-increase – because we realize approving more taxes just enables the General Assembly to continue in its wasteful habits. 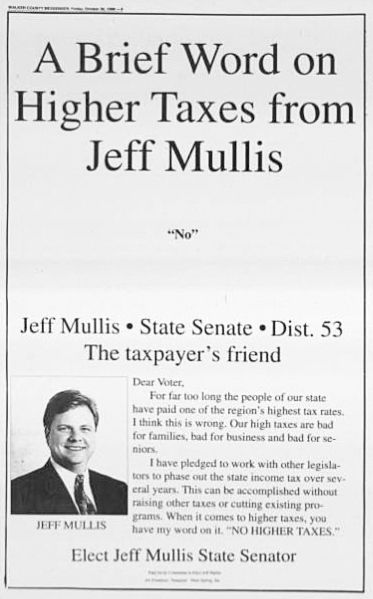 In 1998 and 2000 Jeff Mullis ran for State Senate on a very similar position of cutting waste and keeping taxes low. But now that he’s been in office for ten years, Mullis has changed his position completely. HB 277 comes from an idea MAGLEV Mullis had several years ago, and he was one of the measure’s most passionate campaigners within the senate. Gilmer County Commission Chair Mark Chastain said Mullis’ statement “seems like coercion at best and at worst another word that maybe I shouldn’t use” and called the legislation “disingenuous” because it lets state legislators claim they never raised taxes even though HB 277 essentially forces voters to raise their own taxes if they want to have access to state road money. Likewise, Dalton Mayor David Pennington accurately described SPIDITSLUT as the “largest tax increase in Georgia history” based on the tax’s revenue projections. 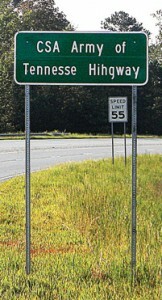 Pennington additionally expressed concern for the economic impact yet another sales tax will make on state residents. Of course state residents do still have a say in all this. When the regional tax comes up for a vote in November 2012, we can all vote against it. That will result in fewer state funds being available for state and county road projects, but for residents of Walker County that won’t make much of a difference anyway since city and county leaders waste road money on places where nobody actually lives. 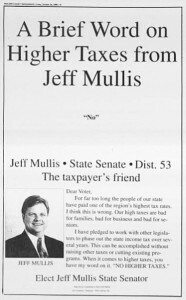 We can all stand up in November 2012 and send Jeff Mullis back the message he used during his 2008 campaign – “No” on higher taxes and “No” on legislators and local leaders who try to convince the voters those higher taxes are in their best interests. Well you know that if its going to put more money into Bebes Pocket then she is going to apporve whatever tax increase she can. Not sure it will give her any more money, although everybody sitting on any of the committees gets paid back for their expenses related to meals and travel to meetings.. Probably a free trip and overnight stay in Dahlonega for her every quarter, not much else financially. The county won’t get much more money if it passes, and if it doesn’t pass that just strengthens her excuses for why the county never paves roads. It does give her and Jeff Mullis another prestigious group to claim membership to and lets Jeff rub shoulders with the Dalton/Calhoun people who will put him in office once he creates a new US House district for himself in January. That’s a thought worth adding to the main article, and I just did so. Stinks we didn’t know about this bill and have a chance to write this before the July election. Mullis has no opposite-party opponent this Tuesday so he’s going to be in office until at least the end of 2012. That does, however, give us a chance to vote against him and his SPIDITSLUT at the same time that November. Well considering she just got a raise it wont kill her to spend some money. Did she get a raise? We couldn’t get anybody out to the county budget meeting.. Would love to get a copy of that budget, they break the law by not letting anybody have a copy when we ask for one. As predicted, our local representatives for the SPIDITSLUT roundtable are Bebe Heiskell and Neal Florence, two local leaders who have proven themselves completely incompetent when it comes to road maintenance. So there you go. Vote for another tax on yourself or Bebe WILL let your road continue to fall apart, just like she’s been doing since 2000. There’s no guarantee it won’t fall apart when you do vote for the tax, but she’s not paving anymore without you agreeing to raise your own taxes. Who needs roads when 99% of the people being asked to pay for them won’t be able to afford to use them? No! No! No! No! No new taxes. We are drowning in taxes. Look around. Are people wasting money like our elected officials? So many are living paycheck-to-paycheck. One new expense and they cannot make it. I can see it now. 100% of the Villanow voters vote for the new sales tax and Bebe rewards them with a gold dome on their new community center. The first SPLOSH was wasted and so will the new one if we allow it. Vote No.